When someone mentions kittens, you might immediately think of cute, cuddly fur balls playing together one minute and curled up, sleeping sweetly the next. If only they all had this life, with a home, warmth, food, and love. 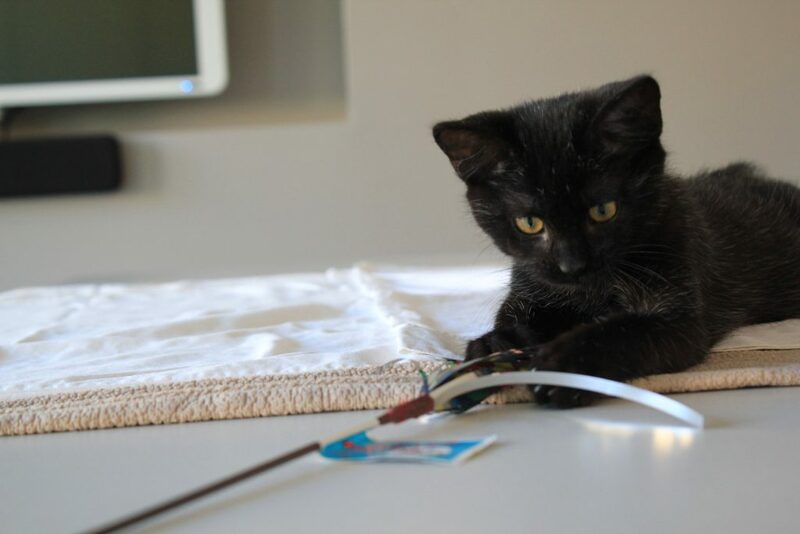 Your gift this holiday season gives cats like Catbot a second chance. Would She Be Alive Tomorrow? Catbot was spotted wandering near a house that, fortunately, was home to Good Samaritans. They saw Catbot’s ragged appearance and unsteady gait. They knew she needed immediate help and brought her to Tree House. Alone, frightened, sick, and going downhill quickly. Catbot was hungry and horribly malnourished. One of her eyes was badly infected and swollen shut. She was very thin and had lost fur. She had raw, bleeding sores on her neck. She was scared, tired, and in critical condition. This kitten needed immediate care. Our veterinarian examined her and found that she was malnourished and had a severe eye infection. But the bigger problem was what appeared to be a bulging growth on her neck with two small holes. 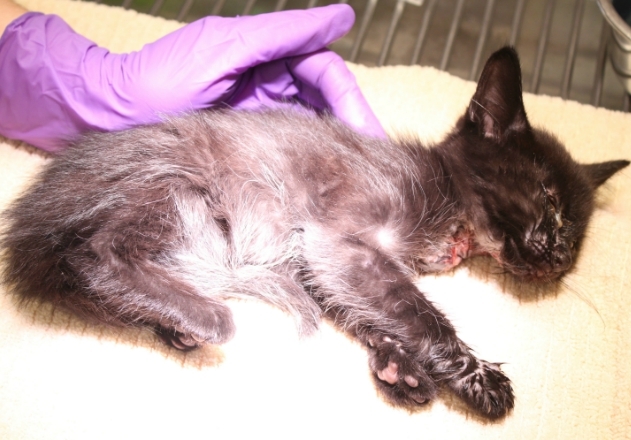 We discovered this tiny kitten had two long, parasitic insects moving inside her neck. These wormlike insects are very painful and can be deadly if not treated. Our veterinarian was able to gently extract the insects and clean Catbot’s wounds. We gave her antibiotics and medication for her eye infection. With food, water, and care, this sick little cat was on the road to recovery and was placed in a caring foster home to regain her strength. After just 5½ weeks in foster care, this resilient kitten was happy, healthy, and energetic — just like we all picture kittens to be. Catbot became a resident in the kitten colony on our adoption floor. Four days later, a loving family adopted her. Catbot has recovered incredibly well. It is hard to believe she is the same kitten who first arrived — so sick. Her eye and the wounds on her neck are healed, and her fur has grown back. Catbot is a joyous kitten who loves toys and exploring new places. Her favorite thing is a chin rub, and she’ll start purring as soon as you touch her! Thankfully, Catbot finally has a home. But there are thousands of cats who are in desperate situations like she was. Your donation helps transform their lives, too! Saving Strays is What We Do. But We Couldn’t Do It Without You! Tree House is working toward a world in which every cat thrives. We are especially dedicated to saving stray cats who are in difficult and life-threatening situations. Together we give these cats a second chance to not only survive but thrive. Since opening our new shelter last year, your generosity has helped us place more than 1,000 cats in homes, provide more than 1,200 spay/neuter surgeries, and increase our team of colony caretakers to 1,000, supporting more than 4,000 cats in the community. All of these cats have a better life because of you! Many are alive solely because Tree House, with your help, was able to provide expert care. Your donation is the gift they need. Help give hope to thousands of homeless cats like Catbot this holiday season. This entry was posted in Uncategorized by treehousecats. Bookmark the permalink.